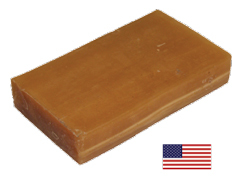 Pure, natural beeswax can be used as a friction polish to finish wood mounted on the lathe. Beeswax produces a soft, low-lustre sheen. Beeswax may be applied on bare wood, or (as Richard Raffan suggests) over mineral oil, for a deeper, nontoxic finish, and has many other uses in the shop. Available in 1 lb. blocks.